The Japanese Navy designed ohka rocket-powered glider bombs to be used exclusively for suicide attacks. An ohka pilot had no chance for survival once released from the mother plane, a Betty twin-engined bomber. This four-page comic erroneously implies that the ohka pilot might survive by "hoping to exhaust his fuel and somehow land miraculously safe." Sam Glanzman, who served aboard the destroyer U.S.S. Stevens (DD-479) during World War II, wrote over 60 short episodes about the ship. "Ride the Baka" tells of a kamikaze attack by an ohka glider on the Stevens, but the speeding weapon just misses and goes far past the destroyer until crashing into the sea. The comic never uses the weapon's Japanese name of "ohka" (meaning "cherry blossom") but instead refers to it as "baka" (meaning "fool"), the term most commonly used by Americans during the war for this unique weapon. 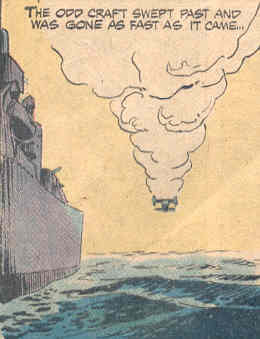 Although the drawings fairly accurately depict the destroyer and ohka weapon, the story contains several inaccuracies. The comic gives the impression that the ohka's rockets can be used for several minutes, but the historical ohka's three rocket engines had thrust duration of only 8 to 10 seconds (O'Neill 1999, 154). 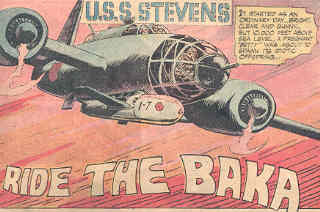 The Betty bomber in the comic releases the ohka 32 miles away from the Stevens, but the actual range of the weapon was about 23 miles (Francillon 1979, 482; no date, 117). This assumes the ohka was released at about 16,400 to 18,000 feet, but the comic's ohka gets released at only 10,000 feet. In actual battles, the ohka was effective only when launched at close range of 10 miles or less (O'Neill 1999, 158). The men on the destroyer Stevens go to battle stations only after a sailor relaxing while reading a comic book catches sight of the ohka skimming the water toward the ship. In World War II, the Japanese never surprised the Americans in such a way with an ohka attack. On the contrary, American planes shot down most Betty bombers even before they reached the point where the ohka pilots could enter the gliders to be released. The narrator wonders, "Had the pilot intentionally missed?" This theme of kamikaze pilots not really wanting to hit enemy ships reoccurs often in non-Japanese writings, but no evidence exists that ohka pilots had any doubts about completing their mission if they had the opportunity to do so. The comic ends with the following statement: "MAKE WAR NO MORE." The same slogan appears at the end of the other two stories in this comic book Our Army at War No. 248. The book's main comic with Sgt. Rock has a clear anti-war message when his squadron shows extreme reluctance to carry out their orders to execute soldiers who ran away from their posts while under enemy fire. The book's strong anti-war sentiment may explain why "Ride the Baka" portrays a pilot who probably intentionally missed his target while hoping to survive even though this depiction has no historical basis. ________. No date. Aircraft Profile 210: Mitsubishi 4GM 'Betty' & Ohka Bomb. Windsor, UK: Profile Publications Limited.